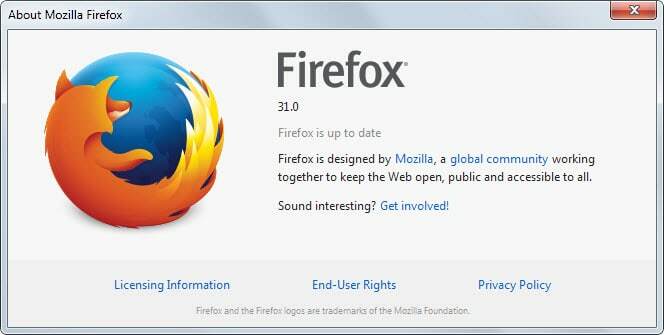 Firefox 31 released: Find out what is new | ComTek Computer Services Inc.
Mozilla will release updates for Firefox on all channels and platforms later today that increase the version of the browser by one. This means that stable users of the browser will get updated to version 31 automatically, while beta, aurora and nightly users are moved to Firefox 32, 33 and 34 respectively. The update has not been released at the time of writing, but several third-party download sites and Mozilla's official FTP server are already listing it. It is however recommended to wait until the update is officially released by Mozilla as last minute changes may make the non-profit organization pull what you have downloaded. You can find out which version of Firefox you are running by loading about:support in the browser. There you find the version value listed under Application Basics. Check out our download guide for Firefox if you need assistance with that. A search field has been added to the New Tab Page. Several under the hood changes such as a new default certificate verifier or generational garbage collection. Ogg and pdf files are handled by Firefox by default if no handler is specified on Windows. Implementation of CSS3 variables and WebVTT. Firefox supported several placements for close buttons on the tab bar of the browser. 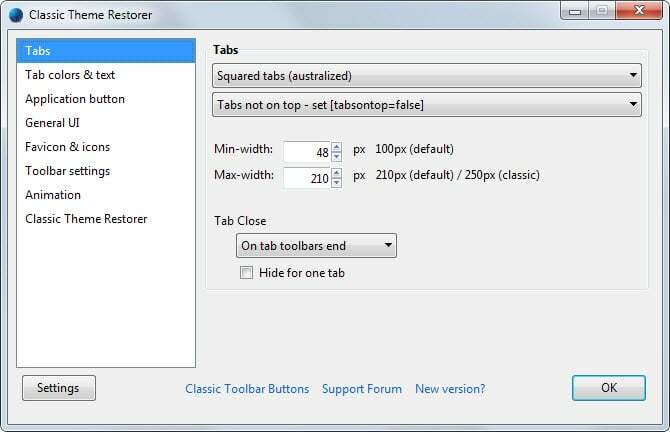 The default setting displayed close buttons next to each tab but you could modify the browser.tabs.closeButtons preference to modify that so that the close button was only displayed on the active tab, at the end of the tab bar, or not at all. This preference is no longer functional and Mozilla suggests to users to use add-ons instead to change the tab closing behavior. If you have modified it in the past, you will notice that Firefox has modified it automatically to the default again (which is one close button for each tab). Add-ons such as Classic Theme Restorer provide you with the means to change that behavior. Additional information about the change are available here. 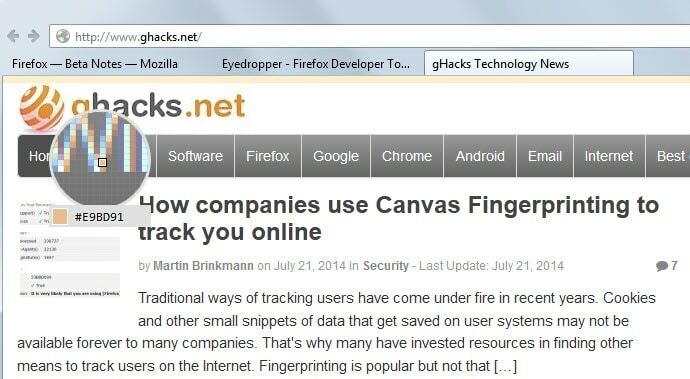 One of the few changes in Firefox 31 that users will notice. 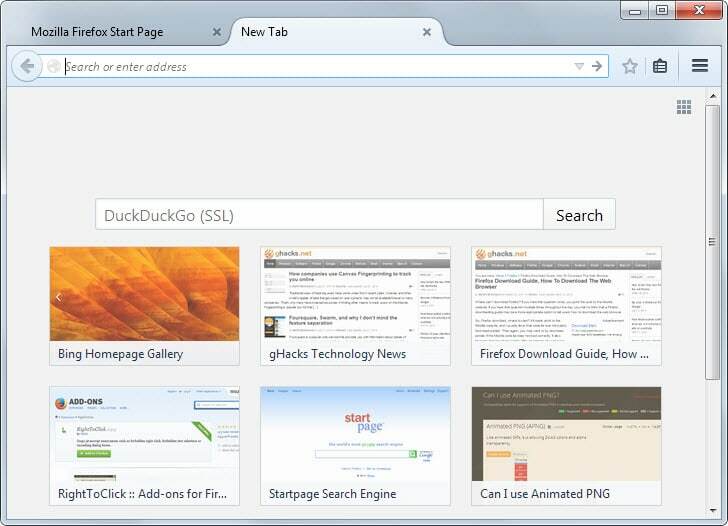 Mozilla has added a new search field to the browser's New Tab Page that is displayed directly above the thumbnail grid. The default search engine of the browser is used for this, and searches conducted here are loaded in the same tab. There is no built-in option to turn it off. The next best thing you can do is install an add-on such as New Tab Tools that comes without a search option. The code is more maintainable as it has been reduced to less than 5000 lines of code compared to NSS' more than 81,000. The new code handles cross-signed certificates better. Additional details about that decision can be found on the Mozilla Security blog. Mozilla did make changes to policies as well which you find listed here. This is another under the hood change that most users may not notice at all. The implementation improves performance of Firefox, at least in some benchmarks. Compacting Garbage Collection is the next big project in this regard. Mozilla hopes that it will reduce memory use significantly when it lands. If no program is associated with ogg or pdf files on Windows, Firefox will handle these types of files directly. Firefox will use its internal pdf reader and the HTML5 media player for ogg files if that is the case. WebVTT is a text-based format that can be used to display text tracks using the <text> element. 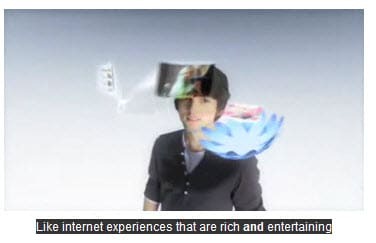 Its primary use is the display of subtitles when <video> elements are loaded. Instructions on how to use WebVTT have been posted on the Mozilla Developer website. You can check out a sample HTML5 video that uses WebVTT here. OpenType Math table partially implemented. See Mozilla Wiki and the MathML Torture Test for details. Editable Box Model. When you are using the Inspector, the box model view is displayed as well. You can now edit values in the box model view directly to change it on the page you are on. Code Editor improvements. You can use Sublime Text key bindings by assigning "sublime" to the devtools.editor.keymap setting in about:config. Copy as cURL. This copies the network request to the clipboard using the cURL command. Styled console logs. Starting in Firefox 31, you can use the "%c" format specifier to style console messages. navigator.sendBeacon enabled by default. [MDN article]. 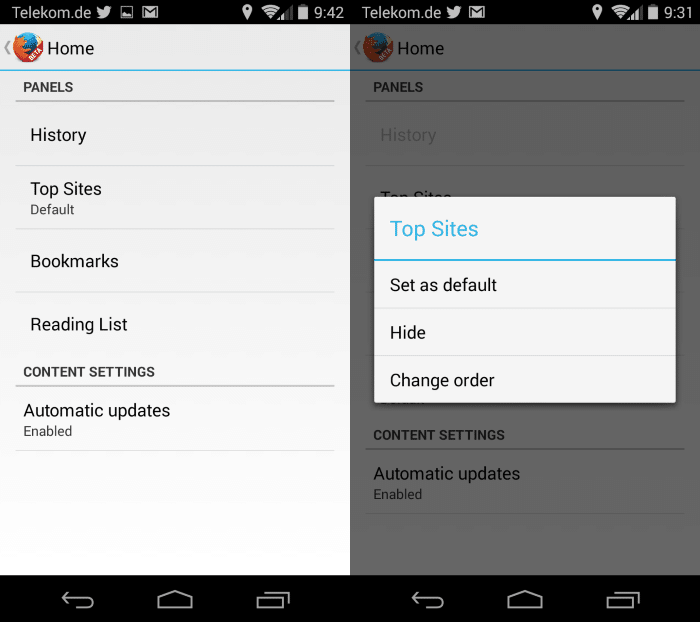 A panel displays information when you open a new tab page or the about:home page in Firefox on Android.Default panels that Firefox ships with display the history, top sites, bookmarks, and the reading list. Tap on the menu icon in the top right corner of the screen and select Settings from it. Select Customize on the settings page and on the next page Home. Long-tap on any panel installed here and select change order from the context menu that is displayed when you remove your finger. You can then use the move up or move down option to change its location. Most features of the desktop version are integrated as well.